Celebs & Classic TV – Cuddle Up! Since the famous and infamous flaunt their spectacular flair, and their poorly disguised flaws are unceasing news fodder, let's think about why they’re loved or despised, which may offer insight for a review of your personal traits, January 39ers. Do you share a 39er birthday and the suave Capricorn personality of Patrick Dempsey (50, Jan. 13)? 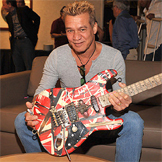 Or are you known more for your talented quirkiness akin to Aquarian Eddie Van Halen (61, Jan. 26)? How do you plan to spend your January birthday? Hate the cold? Snuggle under your fave blankie and watch your fondest classic TV show – it’s gotta be airing somewhere! Were you takin’ it One Day at a Time 39 years ago? While you’re crunching popcorn, take a moment to reflect on the past and your inner personality, rejoice with your present environment (or plan to change it), and rejuvenate yourself for a New Year of adventure! Join the 39 &Holding Club!